This one is a quick recipe that involves no more than mixing a few basic ingredients and patting the dough into the pan. No need to wait for the dough to rise with this. Pre heat oven to 190C/gas 5. Combine flour, salt, sugar and yeast in a large bowl. Mix in oil and warm water. Spread out the dough on a large pan, or 2 pans and bake for 10 minutes. 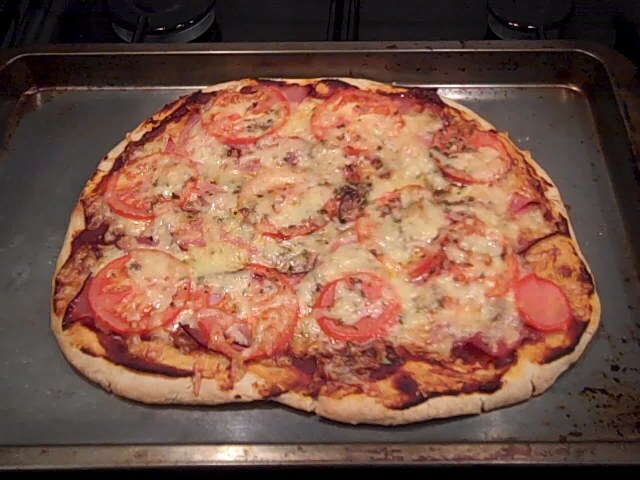 Remove from oven and add your favourite toppings. Turn oven down to 175C/gas 4 and bake for a further 20 – 25 minutes, keeping an eye on it as it might need turning halfway through baking.